I’ve developed 9 separate modules for a course and prepared SCORM 1.2 versions for use by external clients. 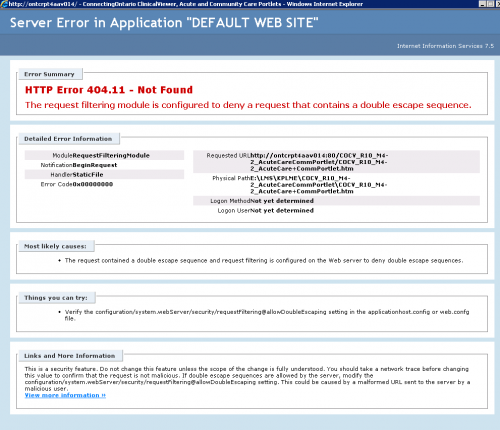 When two of the courses are uploaded to the LMS (Knowledge Presenter v 11.00 and Saba), the following error displays “Server Error in Application “Default Web Site”, HTTP Error 404.11 – Not Found”. Screen shot of full message below. All courses prepared the same way and published with the same SCORM settings (Incomplete/Complete; User Access). I’ve tried suggestions from previous posts on the same error found here but still encounter the same error. Any further suggestions?